Delheim's latest Pinotage is a Cracker! It’s a tradition that on our last day in the Cape we have lunch at Delheim. We ordered a bottle of their MCC sparkler in consolation of the forthcoming journey home and I chose the scrumptious Cape Malay Chicken Curry wrapped in a filo pastry parcel. Delheim change the menu in their garden restaurant every month and if I miss the lamb curry served in its individual potjies I always find another favourite. By chance Nora Sperling-Thiel (owner/marketing/exports) was dining with some guests and she asked Brenda van Niekerk (pictured left) to spare a few moments from winemaking duties to show me her 2008 Pinotage Rosé. I’d tasted a still fermenting sample previously, but now that wine was complete and had been bottled a few days previously. Brenda told she’d blended in 6% Muscat to give a little sweet lift; there’s 5.5gL residual sugar and the alcohol is a lunch friendly 12.5%. The colour was bluish red with a rose petal bouquet. At first it tastes another easy going pink wine with delicate rose petal flavours and a refreshing pear-drop acidity on the finish. But I returned to it and realised there was more complexity than at first appeared and it’s a rewarding summer’s day drink. I’ve thought Delheim’s recent Pinotages have been a bit dull, but this one was right back on track. It is lively and interesting with dark plummy fruits to the fore and wood tannins developing on the finish. It shows all the signs of an excellent wine, good for drinking young but with plenty of potential for aging. I'll be looking out for this when its released. Sad as I was to leave Delheim and to be heading home to a cold England, I was thrilled to see that my book Marilyn Merlot and the Naked Grape was on sale in Delheim's gift shop at the entrance. 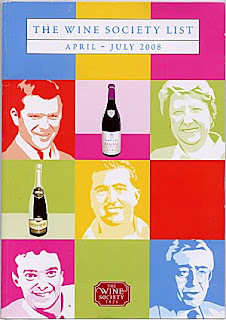 The books contains one of my favourite winelabels, which is Spatzendreck, Delheims sweet wine that has such an amusing story behind it. He is 'making some of South Africa's finest reds' and is one of five of the wine worlds 'movers & shakers' selected to have their picture on the front cover of The Wine Society new wine list. The others are Thibault Despagne of Chateau Bel Air, Susana Balbo in Argentina, Etienne Hugel in Alsace, Serge Hochar of Chateau Musar in Lebanon and Giovanni Manetti of Fontodi Estate in Chianti. 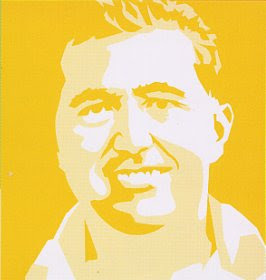 But in pride of place in the centre is this image of Warwick Estate's Mike Ratcliffe. Warwick' wines currently listed by the Wine Society are their Trilogy bordeaux blend and a specially crafted Cape Blend. Winemaker Louis Nel told me that that for the Wine Society he experimented by adding some Shiraz to the Three Cape Ladies blend of Cabernet Sauvignon, Merlot and Pinotage. The Wine Society blend was so succesful that Shiraz then became part of the ever popular Three Cape Ladies. The Wine Society's Exhibition Cape Blend 2004 (£8.95) is aged in oak for 24 months and is a serious richly textured and fruity wine and very enjoyable now, but I'm keeping some back for aging. The Wine Society, whose full name is The International Exhibition Co-operative Wine Society is the world's oldest wine society, founded in 1874 after the international exhibition in London that year was left with some barrels of wine. The Society is owned by its members . Membership is forlife and can be passed on to your descendents. The Society maintains a wide range of own label wines in two tiers. The Exhibition range is the premium one. Being invited to plunder Beyers Truter’s private cellar was dream come true. There is capacity for 30,000 bottles; many of the wines were made by Beyers and alongside Kanonkop and Beyerskloof are own label wines from UK supermarkets he’s made wine for. And there’s also an eclectic collection of many different South African wines and a good number of wines from other countries. 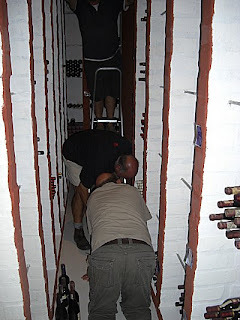 Francois, Corius and I went hunting for interesting wines; Beyers had suggested we choose eight bottles but he soon joined in pulling out wines and we quickly had 11 wines. 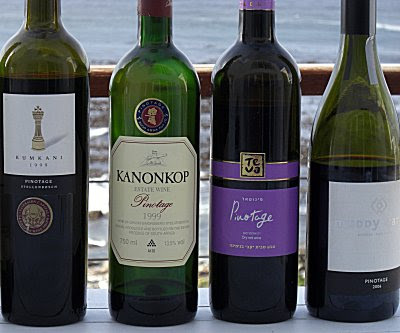 My picks were a 1982 Zonnebloem, 1996 CWG L’Avenir and a 1999 Kanonkop. Upstairs the wines were opened. Beyers explained the format of these evenings “We pour a glass of each in turn and drink and discuss them.” There was no spittoon, we would take time to relish the wines. 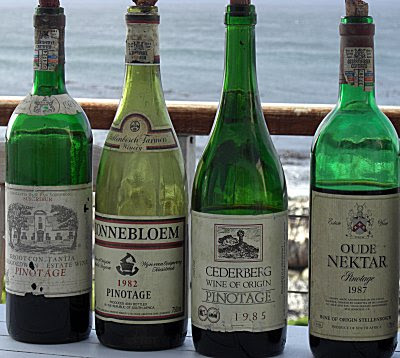 “They were one of the first Estates to make Pinotage”, Beyers remarked. There was some discussion about concentrating this wine to use as a marinade or for drizzling over Christmas cake. PM – “Beautiful: complex and ripe. Lots going on. PM – “Incredible rich black red colour – superb balance. 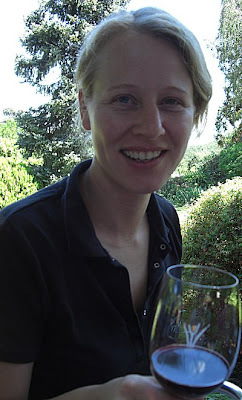 Concentrated dense fruit, great complexity and it is just so drinkable.” I selected this wine because I’d been so impressed with it when I tasted it last year at a tasting at Kanonkop; I wanted to taste it again and I wasn’t disappointed. PM – “Light bright, not very interesting. I was surprised to see this in Beyer’s cellar but I’d introduced him to the MD of winery last year at the London trade fair and Beyers is keen to visit them in Israel. BT – “Yes – raspberry and tea. There’s not enough oak in this. Medicinal flavour will be removed with oak. With a bit of oak it would make a fantastic wine. FN – Dense raspberry. There’s a bit of oak on this; it tastes like crushed raspberries. Ideal to do malo in barrel (or use staves) to tone it down. Very nice acidity. This was the twelfth wine which I had brought from New Zealand. It was winner of our blind tasting of NZ Pinotages and I was keen to hear what the South Africans thought of it. BT: - Very Pinot Noir, I’d love to taste this older. By now it was quite late; Beyers got braai going and cooked meats which we ate with more glasses of the opened wines, and so to bed. The amount left in the bottles next morning indicated our favourite three were Kanonkop, Simonsig and L'Avenir. That morning was magical. Sitting on the balcony with a coffee in the sun we watched two groups of whales to our left while a huge rainbow over the ocean on our right indicated a storm on the other side of the Hottentot Holland Mountains. Then the car was packed, the winemakers switched on their mobile phones and we headed back to Stellenbosch. "The wine was really beautifully balanced, starting with a bottle of Tattinger champagne, moving on to a flowery Marlboro ‘Isabel’ 13 percent ‘06 sauvignon blanc (from New Zealand, of course!) and finishing with a South African Jonathan’s Ridge ‘05 pinotage from the Springfontein Estate in Walker Bay (14.5 percent). The pinotage was notably tasty, with various levels at each stage - the nose was not only flowery but also a little chocolatey, the body being very heavily characterised by blackcurrants and the finish with a very appropriate bitter edge. " " 'Try this,' growled TC. 'This' was spectacularly good, lithe and leathery, brimming with meaty fruit, mature yet still full of life, like a smokier version of old-style Châteauneuf du Pape. 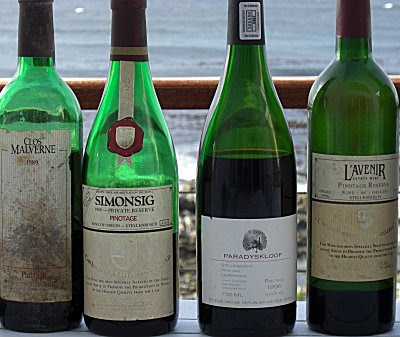 It was a 1973 KWV Pinotage, and even though I visited some of the best addresses in the Cape over the next few days, it was a rare cellar that had anything that topped it. " Palate: Bright red fruit, cherry and strawberry flavors with electric high acid notes, some smokiness to the mid-palate and a long bright finish. Tannins were fine and well integrated. Medium to full bodied. Overall perception: This is not your Mama's Pinotage. This is a wine of much lighter weight, yet much greater elegance than I've seen this variety display previously. The levels of fruit intensity, acid, and freshness of color suggest that it will evolve well and pick up a little weight while defining its complexity further. No burnt rubber here. "I remember a time when Pinotage was a scary grape variety to make wine out of, many a wine was considered “rustic” and that was putting it nicely. Lammershoek 2005 Pinotage ($18.95 - #954594) is as far removed from those original Pinotage wines as you can get. The nose is spicy with black fruit, bramble and a touch of floral; while the flavours are explosive in the mouth: black currant, blackberry, spicy and tannin, there is a little bit of the typical South Africa flavours on the finish, but it’s so “way back there” that it’s practically standing in the corner un-noticed." Ashbourne '04 Pinotage (Hamilton Russell) Walker Bay: startlingly fresh, with a charming carafe rusticity. Not remotely reminiscent of what I consider to be Pinotage's traditional signature (sun-baked road kill mingled with tarmac, rubber and thirsty dog’s breath). 2003 Slaley Pinotage ($30-35). This is a 100% Pinotage from the Stellenbosch region. The vines are about 48 years old. It has an alcohol content of 14.5% and spent about 13 months in wood (90% new oak), 40% American oak. This is a wine that is meant to be cellared for about eight years. It is not really intended to be drank now.The wine is fairly dark red in color and is very tight on the palate. It is obviously a big wine with elements of cocoa, plum, vanilla, dark berries, and spice. It also has a very long finish. I liked this wine and it definitely has much potential. I would be very interested taste this in several years to see how it developed. If you like Pinotage, it would be worth buying this wine to cellar it for a time.